These Quick Fridge Pickled Jalapeño Peppers are fast and delicious! Skip the store and make your own pickled peppers at home with this easy peasy recipe. Now that Summer is winding down to a close, I’m partaking in my annual fridge pickle-a-thon. I should totally just bite the bullet and learn a bit about canning, but this refrigerator method is just so gosh darn easy that I can’t help but go this route. Besides, if I actually did take the time to can a shelf stable batch of peppers I’d probably have it opened and in my fridge within a week anyways! 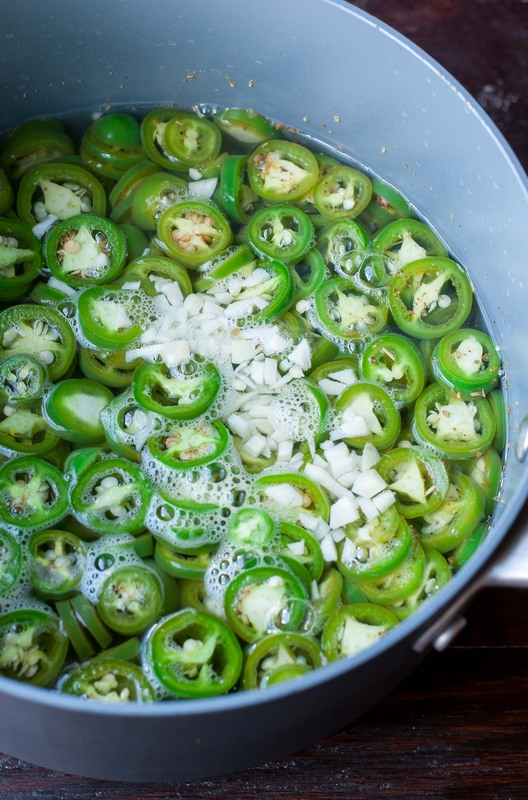 We go through a LOT of jalapeños around here – I love them so! If that’s not cause for nachos I don’t know what is! You could also whip up a plate of Loaded Mexican Sweet Potato Cheese Fries, a big leafy green Buffalo Chicken Taco Salad, or a plate of Bell Pepper Tacos with these feisty peppers as a topping. Good thing I made two! Ready to fridge pickle some jalapeños? Let’s do this! Skip the store and make your own pickled peppers at home. 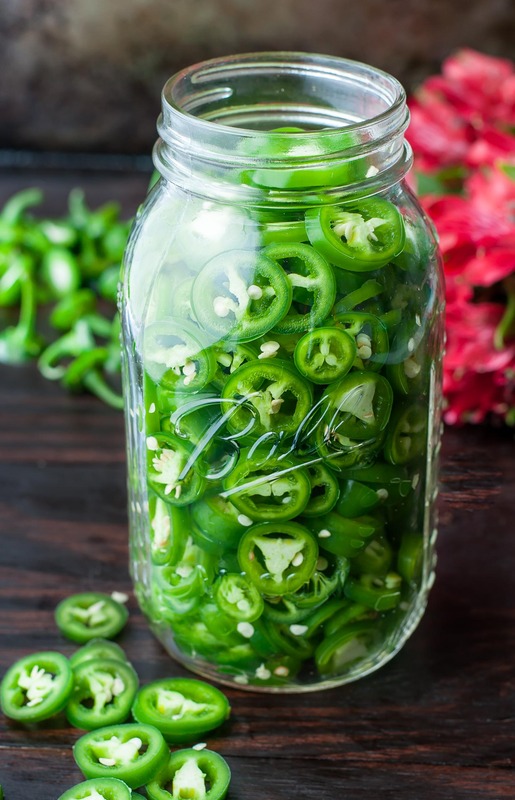 These easy peasy Fridge Pickled Jalapeño Peppers are quick and delicious! Wash and dry a 24-32 oz capacity mason jar. Slice your peppers into discs, discarding the stem. Add peppers, sea salt, garlic, oregano, and sugar. Skip the sugar if you want supremely spicy jalapeños. Reduce heat to lowest setting and simmer for about a minute before removing from heat. Allow to cool (approx. 10 minutes or so) then pour into your mason jar. Slap on the lid and pop in the fridge. That's it! My garden jalapeños were on the smaller size this year, so well over 20 made their way into this jar-o-yum. If your peppers are larger (as most usually are) you'll use less, so instead of focusing on an actual number, I'd aim for almost 3 cups of sliced peppers. Adjust the vinegar mixture as needed depending on how many you'd like to pickle. For paleo pickled peppers, skip the sweetener or cut the heat with honey in place of sugar. If you get a chance to try these Quick Fridge Pickled Jalapeño Peppers, let me know! Fingers crossed I get a third jar out of my garden this year. Though for that to happen I’d be wishing for more sweltering Florida heat and well…. PASS! Seriously. Is it Fall yet?! How long tonthe jalapeños last in the fridge? Thanks so much for this recipe, I’ve been using it for a couple of years now. I make about 20 jars per season and share with the family who all love them . Ohmygosh I am SO happy to hear it David, thank you!!! Do you need to store them before eating or can you dig right into it after it cools? They’re firmer (and spicier) that first day but I honestly love them every stage of the process. We’ll typically put some on tacos or nachos right away and then dig in the next day while they’re still slightly al dente too and then as time goes by they more closely resemble the jarred kind you buy at the store and I love them like that as well. LOL I guess I’m just a jalapeño addict! If you want to dive in right now but want them softer you can actually simmer them in the hot liquid a little longer before starting the cooling process – it’s all on personal preference! Enjoy Ally! I wanted to make your Quick Frig. Pickled Jalapeños . My guestion is how long will they keep in the refrigerator ? Made them w honey substitute. Delicious, my husband loves them & they are not too hot for me! We did wait a week or two before indulging. Aw it sounds like you grew them extra spicy this year! We had trouble with last year’s soil being dry and wound up with CRAZY spicy peppers! I like spicy jalapeños, but there is a way to sweeten them more! You can dissolve more sugar in the pickling liquid to help cut the heat of the peppers. I’d add an extra 1/4 cup of sugar to each jar they’re that spicy and you can always add extra, to taste! Check them after 24 hours. If the peppers are still too spicy for your liking you can actually reboil the whole batch and sweeten to taste that way. The extra cook time can help the sugar nix the spice-factor much faster. I recently read a recipe that was for candied jalapeños and they added 6 cups of sugar per 3 lbs of jalapeño peppers. My jaw was on the floor after reading that, lol! Hey Jenn! Just finished making this recipe with serrano peppers from our garden [didn’t have enough jalapeno’s quite yet!] Can’t wait to taste them later! Yay!!!! So excited for you to dive in! Our serranos are so flipping HOT this year they’re like fire! I think I may end up adding a little extra sweetener to them when I pickle them later so if yours wind up crazy spicy, you can totally sweeten them up to dull the heat after the fact if needed. Or just embrace the heat, hehe! Woot!!!! I can’t wait to go to the store and buy my peppers. I love jalapenos. I will make it and let you know. Yay! Hope you love the pickled peppers as much as we do! Telling the world about these! These are amazing. 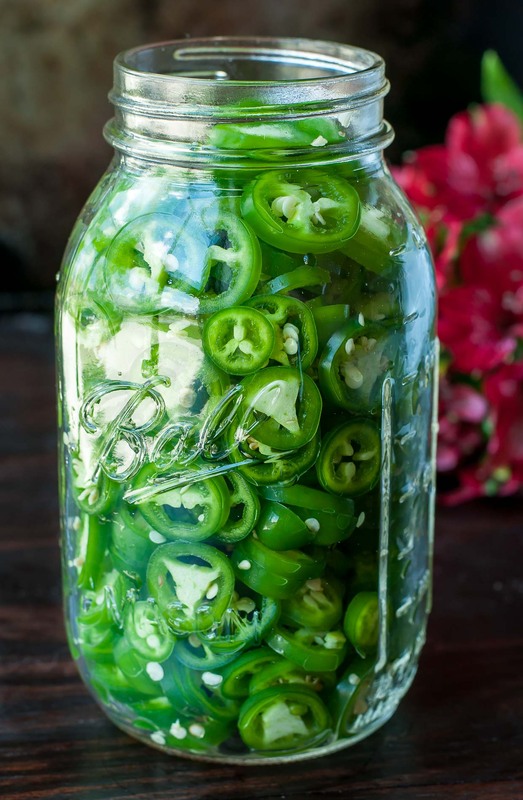 Perfect for all of the jalapenos coming from the CSA this time of year! My husband is the heat lover in our family. I’m going to make these for him as a surprise. He’ll be so happy! How long do these jar jalapeño peppers last in the fridge? I’m guessing like my pickles – 30 to 45 days? Today, I picked aprox 45 large peppers and will be canning this weekend. Let me know your thoughts? Once I would do this! How long does a jar last? This is my go to pickling recipe! Love it!!!! I’m going to try it with banana peppers. So glad you’re loving the recipe Kelly! I used it for banana peppers last week and it works glorious – can’t wait for you to try it! Hi Rose! I have and it’s AMAZING! I blogged about using carrot, cucumber, onion, and radish in my Pickled Veggie Post too! LOOOOVE it! I love making homemade pantry ingredients. These were even better than store bought! I have a crop of peppers this year just perfect for this! Great timing! WOOT! Pickle those peppers girlfriend! I need to keep a jar of these in my fridge! Yes totally! They’re a must! How long do they keep when stored in a fridge? How long does it take for it to be ready to eat? Hey Lucie! I’ve used them later on that same day as making them (they’re more al dente and firm at first but still oh so tasty) and then devour them on dishes all week long. They soften as time goes by so if you would like them softer or more tender that first day you can boil them in the hot vinegar mixture for a few extra minutes, just keep an eye on them so they don’t get too soft and you’re good to go! How long are these good for in the refigerator? Maybe a silly question but I do keep the water/vinegar when I pour it into the jars right? I don’t use water or vinegar, I use soy sauce. It’s the best especially on baked potatoes and salads. I have Mexi-peppers can I use them along with my jalapeños? Good morning from the midwest….. chance of a hard frost later this week. Harvested the last of our crops and made this recipe; Easy…tasty….wonderful recipe. I added some mexican oregano to our batch. 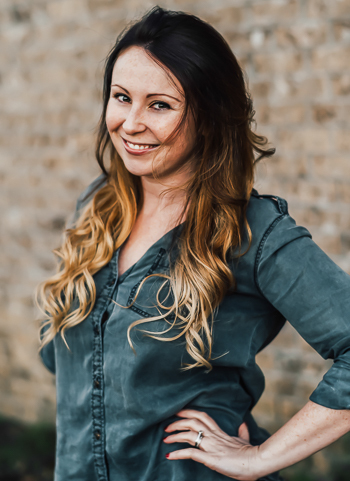 Can’t wait for TaCo TueSDaY….ummmm don’t think we can wait that long! Thank you for the recipe????? Hey Codi 🙂 We usually devour ours within a month or so but I’ve read somewhere they last a few months when you fridge pickle! 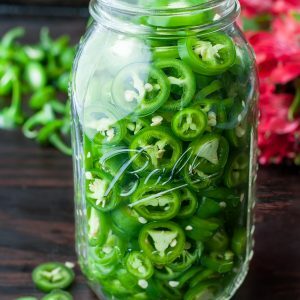 Would you have considered boiling the water and vinegar with the garlic and spices, while slicing the jalepenos and putting them uncooked into the jar … then pouring the brine over them … I’d like them to keep their bright greenness. I don’t know if they would keep any of their crunch. Or do you need to flash boil them to get any bacteria out of them? Hey Caroline! Their bright green hue is eventually fleeing either way (it’s as the cell wall breaks down I believe the color dulls) but I think it can be prolonged the most by skipping the boiling water together entirely and just combining all the ingredients as is and putting it in the fridge. I have a reader who does this every Summer and says the peppers stay crunchy much longer this way. You’re free to try that technique! He mentioned he doesn’t dig in until a few weeks later because of that but if you like extra crisp peppers you could totally dive in sooner I’d imagine 🙂 Let me know how it goes! I’ve already got three bags of diced jalapenos in the freezer for use over the winter. (We like to fry up chopped onions and jalapenos with ground beef, some Worcestershire, and some steak seasoning just to change up our “taco meat” every once in a while. We love putting it on nachos!!) But I still have so many jalapenos in the garden. So excited to try your pickling recipe! Going out to pick today! I’ve tried a refrigerator dill pickle recipe before and have some canning salt from that. Can I use canning salt, or does it need to be sea salt? I used a mandoline to slice my peppers & it worked fantastic! Since all you are really touching is the skin, your fingers only come in contact with minimal hot pepper oils. mine were sooo hot, and I did add sugar…I seemed to have a bizillion seeds though, I wonder if I should have rinsed some out? Hey Pat! I haven’t tried sweetening mine after the fact but I’m willing to guess it’s possible if you’d like to increase the sweetness to counteract the heat. I might be a bit biased though because I looooove them spicy! When the peppers are super spicy to start (I’ve heard the less water they get while on the plant, the spicier they are!) you’re going to for sure have some spicy peppers. Some seasons ours are a bearable face-fanning spicy while other seasons we basically fear that they will melt our faces off. It’s the luck of the draw with jalapeños! Hi! Can I freeze these? Hi Christy! I’ve frozen chopped and sliced fresh jalapeños before (great for soups and chilis!) but I’ve never tried freezing pickled jalapeños before. I hit up Google and people actually freeze pickles and defrost 8-12 hours before serving. It says they can be frozen for a few months and once thawed, to use them within two weeks. Let me know if you try it with jalapeños! These look amazing! What sort of affect does pickling have on the flavor of the jalapenos? Does it change the flavor or affect the heat at all? Thank you for sharing your recipe! Your pictures are beautiful! Hi Jenn, Does the sugar add sweetness or just tone down the heat? I made some yesterday and skipped the sugar because my husband doesn’t like pickled anything too sweet. They ended up a bit too hot. Hey Leslie! If you add a lot of sugar (way way more than the recipe calls for, for instance) it can lend quite bit of sweetness and nix all heat entirely. Adding around 1-3 TBSP of sugar really just acts as heat control, dulling the fiery nature of the peppers. I’ll typically add a tablespoon or two and it makes the peppers more bearable without making them at all sweet, if that helps! Can I use this recipe with banana peppers? So I make pretty much this same recipe. However I don’t cook anything. Everything goes in the jar and in the fridge it goes. It takes a few weeks or maybe even a month before they are ready. And they are magnificent. I am on my last jar right now and good thing my plants are just beginning to yield. What is the reason you cook them? Hi Dennis! I’ve made them both ways and there is truly no wrong way to pickle a jalapeño 🙂 A wee bit of heat means you can dig in as soon as possible, which is great for excited chefs who want to start using their jalapeños the next day! The brief heating breaks down the cell wall of the jalapeño and blanches it, allowing all that delicious flavor to be soaked up right away without resulting in a soggy pepper. It works great for us! 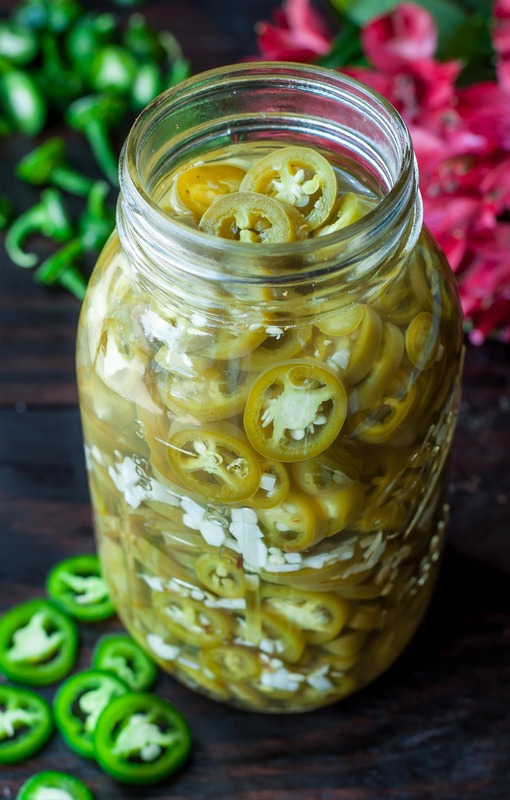 Last year I went through each jar before a month’s time had even passed – we love jalapeños! The last jar I am eating right now was done 9 months ago. Still good. I love them too. I put a couple in nearly everything I eat. Try in mashed potatoes. Here is another thing I do with my refrigerator jalapenos. I empty a quart jar in the Vitamix with equal amount of homemade tomato sauce or roasted tomatoes. I then use this as a hot sauce. I also dehydrate the concoction. Put in a coffee grinder have a shaker full of the salty hot goodness for sprinkling on nearly everything. Ohmygosh in mashed potatoes?! Dennis I am totally trying that… maybe with some cheddar and a dollop of sour cream? So excited! The dehydrated shaker tip is amazing too – thanks for all the great ideas 🙂 Jalapeños for the win! Ryan that combo sounds AMAZING! Totally trying it! I made these today and I have to say, they’re life changing! I love jalapenos, these took me about 5 minutes to prep and were absolutely perfect!! I don’t think I’ll ever buy store bought jalapenos again! Have you ever varied the vinegar? ACV? or stick with white distilled? I did rice vinegar once and didn’t hate it! I *think* I like white distilled best but you know what.. I’m tempted to do half white vinegar half ACV next time — I bet that would be good! Are these jalapeños still on the crunchy side? If not, is there a way I could ensure that crunch without jeopardizing shelf life? I feel like they are! They’re on the firmer side yet still tender; though not quite as much crunch as a fresh pepper. You could always skip the heating entirely and pour the peppers and the pickling mixture into the jar and pop it in the fridge right then and there to get even more of an al dente feel to the peppers. They will have the same fridge life but must stay refrigerated unless canned the old fashioned way. Can these be processed in a canner? If not how long do they keep in the fridge? That does it. I’m sold! Thanks for the idea — The Honey will love these! Maybe he’ll slice ’em up for me!! OK it’s off to the Jalapeno store for me! I also hand slice mine. I have no problem with them..